It is also called the Crusade of the Faint-Hearted due to the number of participants who joined this crusade after having turned back from the First Crusade. 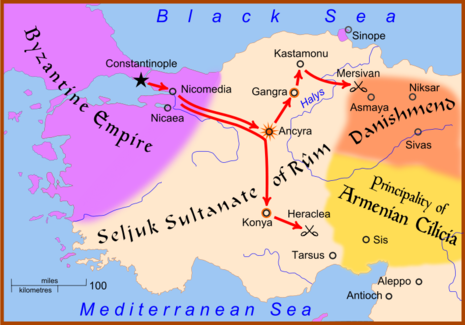 The Crusade of 1101 arose from a well-managed response by the Seljuk Turks to the First Crusade, as the Turks decisively defeated the Crusading armies in three separate battles. Having captured Jerusalem and the Church of the Holy Sepulchre, the crusading vow was now fulfilled. However, there were many who had gone home before reaching Jerusalem, and many who had never left Europe at all. When the success of the crusade became known, these people were mocked and scorned by their families and threatened with excommunication by the clergy. Many crusaders who had remained with the crusade all the way to Jerusalem also went home; according to Fulcher of Chartres there were only a few hundred knights left in the newfound kingdom in 1100. Godfrey himself only ruled for 1 year, dying in July 1100. He was succeeded by his brother, Baldwin of Edessa, the first person to take the title King of Jerusalem.